This guide demonstrates a potential implementation of Deeploop to engage and qualify your inbound leads. Engage your leads in 1-to-1 conversations instead of a mass-mailer. Instantly and autonomously engage inbound leads that reach out to you through a webform. First, ask about their pain points. Then, make sure they process their leads by email, otherwise mark the lead as unqualified. Finally, ask if they are interested in meeting a sales rep for a demo. → Hand-over to a human rep if all milestones are passed. What is the product doing? Here is how a conversation with a lead would unfold. A lead (here: John Doe) is interested in taking a demo. He fills a web-form on Deeploop's website. Deeploop AI assistant (here: Susan Scales) engages him right after the sign-up. You requested a demo with us. Happy to get that on our calendars. Your AI assistant will autonomously engage by email your leads, follow-up, answer their questions and hand them off to your human reps only when they are truly qualified. It is highly flexible & customizable. You can define how to qualify your leads, what questions to ask them etc. With its powerful dashboard, you can see live where are your leads in the funnel, which questions they asked, how many follow-ups were sent and much more. The setup allows for a lot of flexibility, so it would be great if you could guide me. What are you main pain points at ABC Corp? I just wanted to follow up on my previous message. Can you let me know what issues are that you would want address with Deeploop? I hope all is well. I just want to make sure our conversation and demo doesn't fall through the cracks. 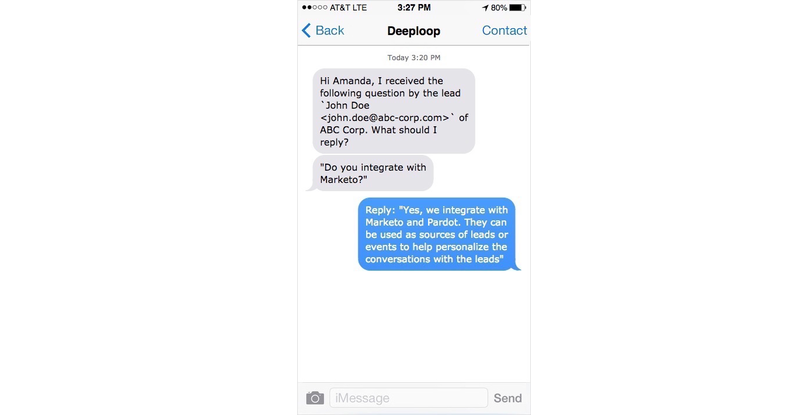 Let me know when you would have time to discuss how Deeploop can help ABC Corp's Sales & Marketing organization. Nice to meet you. I apologize, I'm swamped this week. we are struggling with lead volume. we have hundreds of untouched leads in our Salesforce we don't have the resource to engage. my reps lose time answering always the same simple questions by email. I would also like to start running some outbound campaigns. Deeploop looks like an interesting solution to above. What's the pricing like? Perfect, Deeploop can help with all of that! Our pricing starts at $45 per month and is performance-driven. You only get charged for the leads that engage positively in the conversation. We also offer a 1-month free trial. You can find more information here. A last question: Do you communicate and qualify your leads mainly by email? Because Deeploop AI assistants only communicate by email, even if more channels should arrive soon! Yes, we engage leads mainly by email. Do you integrate with Marketo? Yes, we integrate with Marketo and Pardot. They can be used as sources of leads or events to help personalize the conversations with the leads. Would you be interested in meeting one of our product specialists during the week? Sure, this week might be tight, but the next one should be good. Please meet my colleague Amanda (in cc). She is one of our an Account Executives and she will take it from there. It was great discussing with you! Engage them in natural 1-1 conversations. Find optimal follow-up strategies for them. Answer their questions (while asking for help if a new situation is encountered). 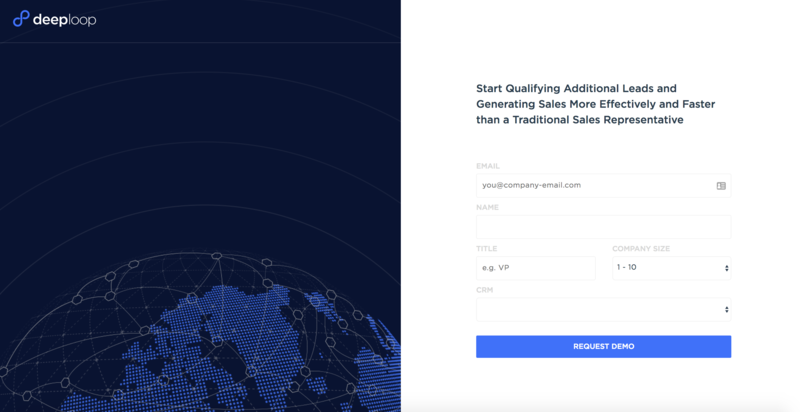 Enable your reps to spend their time only on truly qualified leads!